I literally ran my last race a year ago, and I just ran a 5K with the whole family, all 5 of us! The event was HERS Keep A Breast 10k/5k at the very nearby Quarry Lake. Though I have been running on the treadmill, I still have not gotten myself back up to 10k shape, so I elected to do the 5k instead. Even thought I had been doing well, running with babies and strollers was altogether another deal. Even though it was mostly flat, it won’t be completely flat so I wanted to focus on just getting out there and having fun. There was plenty enough to worry about that I hadn’t done in a while: day before outfit prep, stroller checks, snack bagged, water bottles filled, and piling it all to the trunk of the car Tetris style to make it all fit. Basic time scheduling to make sure we are not late but also not too early so the kids don’t have much time to whine. Luckily it all worked out pretty well. We got there and parking, picking up registration and bibs, and getting the kids ready were all pretty smooth. The only issue we had was getting stuck behind a lot of walkers in the first leg of the race. Next time we will get behind the 5k runners instead. 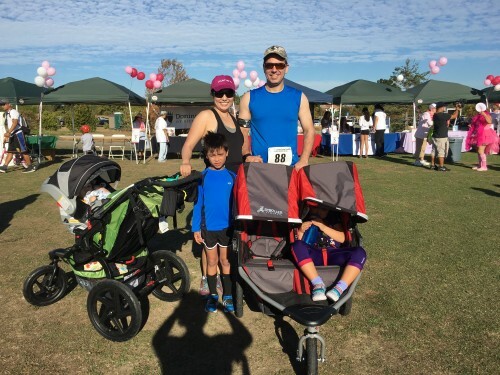 This occasion also turned out to be the first time that my 6 year old son did a 5k without using the stroller at all! 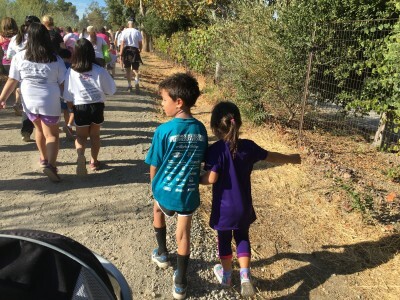 While my boy did not run the whole way, he managed to walk-run the 5k, and beat both me and my husband to the finish line,with us barely able to keep him in our visual. I was surprised and impressed at the same time. Roger lived high giving everyone and all the cheering. He couldn’t wait for the next race! I will be looking forward to our next race, in a month.